Rethink the way you live! Embrace the chic urban lifestyle at The Place on First in vibrant downtown Fort Myers. With a prime location on the corner of First and Jackson Streets, directly across from the Sidney & Berne Davis Art Center, The Place on First is nestled in the heart of the Fort Myers River District. It will be just steps away from dining and entertainment hotspots including the Florida Repertory Theatre, Fort Myers Yacht Basin, Patio De Leon and Harborside Event Center. 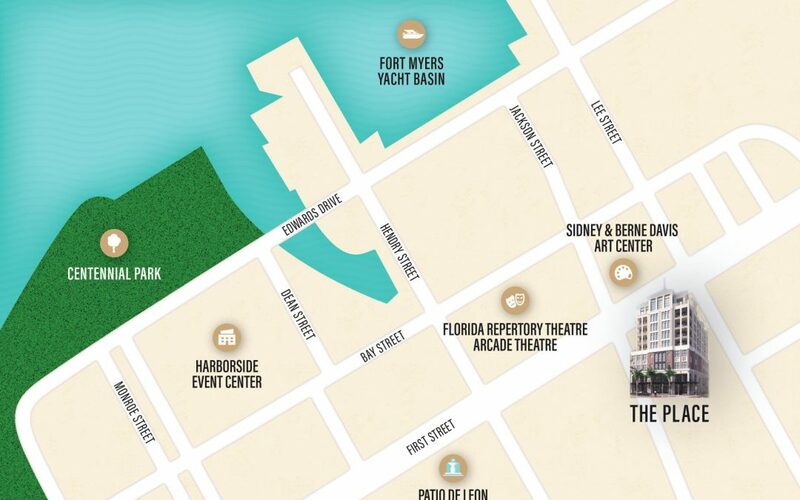 A new mixed-use building coming to downtown Fort Myers, The Place on First offers Class A office space, multiple restaurant and retail destinations, and 16 exclusive residences on the building’s private upper floors. Luxury features include the ninth-floor Sky Terrace, grill area, fitness studio, two hotel-style guest suites, bicycle storage, and state-of-the-art entry access. Urban-style elements throughout each residence, such as cove lighting, are a part of The Place on First’s unique design aesthetic. The Place on First lifestyle awaits those who desire the vibrant culture of downtown Fort Myers. Reservations are now being accepted for The Place on First. Future residents will be able to choose from four different floor plans. The plans will range from 1,285 up to 2,365 square feet and be priced from the low $400,000s to the high $800,000s. For more information, please visit the website at www.ThePlaceOnFirst.com, or call 239-595-8690 to schedule an appointment to visit the Preview Studio, located at 2275 Main St. in Fort Myers.